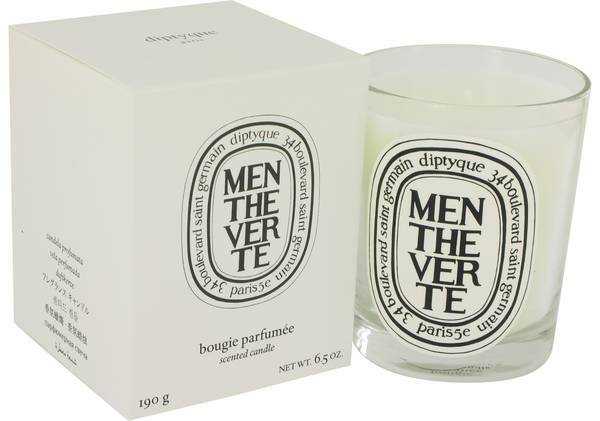 Diptyque Menthe Verte Perfume by Diptyque, Diptyque Menthe Verte is a scented candle by Diptyque, a French fragrance house that specializes in candles and home fragrances. This candle is inspired by the aroma of spearmint, refreshing and invigorating and brisk. The scent evokes the image of gathering fresh mint from an herb garden on a cool morning before the summer sun warms the air. A touch of pepper and spices add just a bit of sharpness, which is a delightful contrast to the sweet mint. Read More Read More This soy-blend wax candle has a burn time of 60 hours and comes in an elegant glass container with a black-and-white label. Diptyque was founded by three friends, Christiane Gautrot, Desmond Knot-Leet and Yves Coueslant, in 1961 in Paris. The interior designer, painter and theater set designer collaborated to open a shop to sell furniture, fabrics and home accessories, including candles of their own creation. The company has become world-famous for its luxury line of candles and fragrances. All products are original, authentic name brands. We do not sell knockoffs or imitations.